What is an onlay crown? An onlay crown is an ideal way to restore a decayed or broken down tooth. The special shape of an onlay crown protects the tooth from further damage whilst leaving healthy un-weakened parts of the tooth intact. Q. Why would I need an onlay crown? What are onlay crowns made of? How is the tooth prepared for an onlay crown? All decayed or weakened parts of the tooth are removed; the dentist will then take an impre ssion of the prepared tooth. This impression, along with a record of the shade of your tooth will be sent to the dental laboratory where your onlay crown will be made. 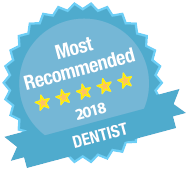 A temporary filling will be placed in your tooth to protect it for the two weeks which it takes for the technician to make your permanent onlay crown. Will the onlay crown be noticeable? How is the onlay crown fixed to the teeth? 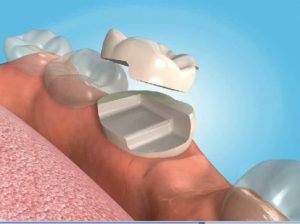 Once the fit and appearance has been checked and approved by you and the bite checked and perfected by the dentist, the onlay crown will be cemented in place with a special dental cement.